Like blackberries, sloes are often picked by people who don't otherwise scour the hedgerows in search of forageable goodies. When sloes are someone's only foraged food, they tend to get made into sloe gin. I have a bit of a problem with the concept of sloe gin, in that if I'm buying alcohol to start with, why not just drink it as it is? For my foraged and home-made drinks, I'd rather use sugar and let yeast make the alcohol for me. The sugar still has to be bought, but it's closer to self-sufficient booze than buying booze to start with, I feel. With this in mind, I experimented with sloe and elderberry wine a couple of years ago. This was hugely successful, and I have a batch on the go this year, which I'll file under elderberries and tell you about when it's ready. The usual advice on picking sloes is to wait until after the first frost. This advice is given for various other things, including parsnips, and I'd heard that it's just an indicator of season, and when they're likely to be ripe. In other words, the frost itself has no effect on the fruit. I had the opportunity to test this theory when I was visiting my sister. I'd picked a few sloes near her house, then a couple of days later we had the first frost of the year, so I went back and picked a few more (not from exactly the same place, but somewhere a little closer, as we were leaving that morning and I didn't have very much time), so I had two samples of sloes to take home with me, picked just a couple of days apart, but before and after the first frost. Once home, I split the earlier sample and put half of it in the freezer overnight, which some people do to mimic the effect of frost. I did my best to set up a blind taste test. I put my samples in three ramekin dishes and stuck labels to the bottom of the dishes. Over the course of a few hours, I then shuffled the dishes every time I went past them, so that I wouldn't remember which one was which. Unfortunately, it was quite easy to tell them apart. The sloes in the second sample were slightly larger than those in the first, and those that had been in the freezer were considerably messier than those that hadn't. Still, I did my best to ignore these features when I tasted them. The first one I tried had the familiar astringency - you know, the kind that instantly removes all moisture from your mouth and turns your face inside out. Yep, definitely a sloe. The second one... Oh! Where has all the flavour gone? On further testing, there was some flavour - mostly of plums - but no face-turning-inside-out astringency. The third one was somewhere between the two - sharp, but quite palatable. These differences were huge - I felt that my precautions to disguise the samples were entirely unnecessary, but then I didn't know there'd be big differences before I did the test. On looking at the labels, sure enough, the first sample was pre-frost, the second freezer, and the third post-frost. Conclusion: Freezing sloes does indeed reduce the astringency and more freezing (overnight in the freezer) reduces it more. I'd read on the self sufficientish website that unripe sloes can be used as an alternative to olives, if soaked in brine followed by vinegar. Back in early September I spotted a great abundance of unripe sloes growing a long way from where I live, making it impractical to go back for them later in the year. I remembered the olive-substitution, and thought I might as well pick a few and give it a try, seeing as there were so many there. At about the same time, I was starting to experiment with lacto-fermentation and noted the similarity of the salt then acid sequence. How about trying lacto-fermented sloes? I started with a fairly strong brine - about a tablespoonful of salt in a smallish jarful of sloes in water. Jar of fermenting sloes. It was fuller to start with - I've eaten some. After a couple of weeks, I diluted the brine a bit (can't remember whether I took some out or just added water) and added a blackcurrant leaf to introduce the right kind of bacteria, then put an airlock on the jar, as in the photo above. I'm not sure I needed to bother with the airlock, as it fermented so slowly. But... it did ferment. Every day or so I looked at it and saw tiny little bubbles making their way to the top of the jar. I usually gave it a little shake to help them on their way. A few weeks ago I tasted one of the sloes... Ewww! Way too salty! I removed about half of the liquid (using it later as seasoning in a stew) and topped up with water (tap water left to stand for a bit to let chlorine evaporate. I've come to accept that too much chlorine is not going to be good for lactobacilli. I've no idea whether the chlorine in tap water is too much but it's easy enough to let it evaporate.) After a couple more weeks of slow fermentation I tried again, and... these are really good! They don't taste exactly like olives, of course, but they're similar enough to be an alternative. If I really wanted some olives and only had these in the house, I'd be happy to eat these instead. Whilst staying with my sister in Sussex a few weeks ago, we went out for several walks and on one of these I spotted a chestnut tree. To be more accurate, I spotted chestnuts on the ground. ... contained chestnuts in almost every shell. I have read that chestnut trees need others nearby to fertilize them, which might have been the problem with the one in my garden. This one presumably had some friends about the place somewhere. I should probably point out the difference between sweet chestnuts, which are what I'm talking about here, and horse chestnuts, otherwise known as conkers. The nuts look fairly similar, though conkers tend to be bigger and rounder, but the shells are quite easy to distinguish - the sweet chestnuts have longer, more densely packed spikes on them. Horse chestnuts are not good to eat, due to the saponins they contain, and probably not even very good for horses in large quantities. Sweet chestnuts, on the other hand, are absolutely delicious! The traditional way of preparing chestnuts is to roast them on an open fire, but having gathered a fairly large quantity, I decided to try something different. Following the River Cottage Hedgerow Handbook, I made chestnut flour. I say, Following - it was a bit approximate, partly due to a delivery of firewood that arrived and needed stacking in the middle of the process. I boiled the nuts for, um, some time, then left them in the hot water for quite a while longer, so they were well and truly cooked (and cold) by the time I go to the next bit. It wasn't so much a matter of peeling them, as cutting the skins and squeezing out the soft innards. This was pretty effective, combined with scraping out the last bits with a small knife. That gave me a heap of chestnut mush, which I mashed up a bit more with a fork, then spread out on a baking tray and put in the oven on very low to dry out, taking it out at intervals to stir and mash it a bit more. After a few hours it was properly dry and, while not exactly flour, could reasonably be described as chestnut meal. The dried meal took up a tiny fraction of the space the original nuts had occupied and I stored it in a jam jar. When I came to use it, I ground it in a pestle and mortar to make it finer, but there were some nutty bits that were too hard for me, so they remained. My first recipe also came from the River Cottage book, though I did modify it (don't I always?) so as to stretch the chestnut flour out a bit. The recipe was chestnut pancakes, which I decided called for rosehip syrup, so I tried making some for the first time (rosehip blog post edited to include syrup), which was a great success. 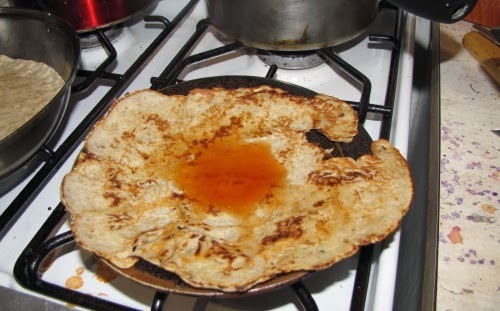 My modification was to replace half of the chestnut flour with ordinary white wheat flour, which I thought would be better for holding the pancakes together, as well as not using up so much of the chestnut flour. 3 oz sugar - I think I used caster, but I'm sure granulated would do just as well. Edit: I forgot the egg yolk when I wrote this - I knew there were something I'd used to stick it together, and I didn't think it was milk. Recipe now amended. Mix together the flour and sugar, then rub in the butter and finally mix in the egg yolk and soaked chestnut flour (it doesn't take very long to absorb the liquid, and it increases in size quite a lot when it does). Press it all together, roll out and cut, then bake at gas mark 4 for... I can't remember... 20 minutes? When they smell cooked, take them out of the oven! These biscuits are really good! You don't have to dry the flour and rehydrate, that was just for storage, you could use fresh, cooked chestnuts. I wish I had more - I only have about a teaspoonful of flour left. I'll have to think of a suitably worthy use for it. Another edit: These biscuits, topped with mascarpone cheese and pickled samphire, are sublime. 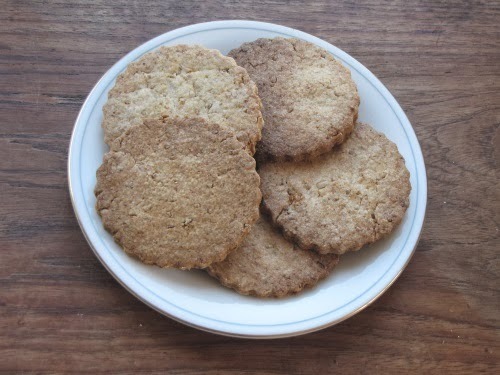 Sadly they're all gone now, and I used the last of the flour in porridge, which was nice, though there wasn't really enough of it to make a big impact on the flavour. This did prompt me to buy three baby chestnut trees for my garden, which I've been meaning to do for ages. Two are now planted and the third is in a pot waiting for its spot to be cleared of leylandii. Some time in the future, I'll have my own supply of chestnuts. In my last post about lacto-fermentation, I mentioned an improved method for keeping carbon dioxide on top of the vegetables. Here's the blog post where I read about it. Just like wine fermentation, an airlock is used to allow carbon dioxide to escape (pushing the air out ahead of it) without letting oxygen in. I bought a couple more airlocks (I have a dozen or so, but they're all in use) for 50p each from the health food shop where I buy my home brew stuff then went to the hardware shop in search of rubber seals. I wandered around the shop looking at various bits of rubber that weren't quite what I wanted, but might do, then approached the lady at the counter. I presented an airlock and explained, I'm looking for something that'll seal that into a jar lid. A rubber grommet would be ideal... I don't suppose you have anything suitable? She reached behind her and took a small box marked Grommets from the shelf, and tried several until she was sure she had the right size, then sold them to me for 15p each. I bought four. With a bit of trial and error, I found the best way of gripping a jar lid for drilling. Trying to grip the edge doesn't work very well, as the edge slips easily if gripped loosely and the lid is flimsy and bends if you grip it more tightly. However, a lid is designed to grip to something - the jar itself - and the jar can be gripped more easily. I drilled a pilot hole first, then used the flat drill bit to make the correct sized hole. It wasn't easy getting the grommets into the holes as I'd drilled the holes to be a very tight fit, and also smeared Vaseline into the groove to stop the cut lid going rusty. I did manage to get them in without too much swearing, though, and then the air lock fitted in quite easily. My next two vegetables for lacto-fermentation - samphire and sloes, of which more in a future post - both had a much higher salt content than the courgettes and beans I'd started with. They both showed signs of fermentation but very, very slowly. I suspected that the bacteria were not thriving in this very salty environment. I decided that the next time I had a suitable opportunity, I'd compare different levels of salt to see whether it made a difference to the speed of fermentation. The opportunity presented itself when a neighbour gave me a couple of marrows (the same neighbour who'd given me courgettes earlier in the year - he now has a great many marrows). I modified the lids of a couple of large jars that a friend had given me (thanks, Steve!) to make two similar fermenting vessels. To keep the two jars as similar as possible apart from the salt content, I filled them at the same time: From the heap of marrow pieces, one handful in this jar, one handful in that jar. After each layer of marrow, I sprinkled in salt: One pinch per layer in one jar, three pinches per layer in the other jar. This is still quite a lot less salty than the samphire and sloes, but I don't want my marrows that salty. Comparing three pinches with one pinch should give a clear difference in salt content, even allowing for variations in pinch size (which shouldn't be systematic, in any case). I pressed down the veg as I went and plenty of water was drawn out, so I didn't need to add any to either jar. Instead of blackcurrant leaves, I inoculated the jars with liquid from the fermented courgettes to get the right bacteria in there*. I had imagined these air locks bubbling as they do with wine, so that I'd be able to count bubbles per minute or some equivalent. Unfortunately it didn't quite happen like that. The bubbles certainly formed in the jars but with the jars so packed full of marrow, they couldn't rise to the top so they just stayed there. Eventually, of course, enough pressure built up that something had to give. What gave was not gas but liquid, which got a little messy. At this stage the 'three pinch' jar was looking distinctly more active than the lower salt jar. I started to worry that I hadn't matched them adequately and had overfilled the 'three pinch' jar, which was why it was overflowing. Although I was reluctant to break the air locks, I opened both jars to push the veg down. There was no sign that I'd overfilled the higher salt jar; in fact, having overflowed, it now had less liquid than the other one. I spooned a little liquid out of the 'one pinch' jar to compensate, and resealed the lids. After that nothing much happened for a few days because the temperature's quite a bit cooler than it was in the summer. I put both jars on top of the cooker for a bit to encourage some action and again, it was the 'three pinch' jar that lifted its cap. Things continued in this vein for a couple more weeks, until I decided that it must be time to open the jars and taste the results of my experiment. At this point another difference became apparent. I had noticed some mould forming at the top of the jars (or is it yeast? Either way, it doesn't smell very nice), and it's not very surprising that there's more in the lower-salt jar. I scooped out all of the mouldy marrow pieces (rather more from the lower-salt jar) and tasted the fermented marrow. Both jars tasted OK - the only difference was that the more-salt one was... saltier. A bit too salty for my taste, actually, so I'm glad I didn't try a higher concentration of salt for the experiment - I would have ended up with a whole jar full that I didn't want to eat. I couldn't detect any difference in acidity, which surprised me, given the apparent differences in fermentation activity, but perhaps I just couldn't tell over the saltiness. The presence of mould indicates that the upgrade wasn't entirely successful. That space at the top was supposed to fill up with carbon dioxide so the mould wouldn't grow there (unless of course it's yeast, which can grow anaerobically, in which case pushing out the oxygen wouldn't help). The fact that the bubbles were getting stuck was a sign that things weren't going entirely to plan. I wonder if I need a little more liquid per vegetable solid, or maybe I just need to cut the pieces smaller so it's easier for the bubbles to find a way through. Either way, I don't want a stack of solid pieces that trap the bubbles when they form. Probably. Conclusion: Three pinches of salt per layer appear to provide a better environment for fermentation than one pinch per layer, though there was no obvious difference in flavour apart from the salt itself, which favoured the less-salt jar. You'll notice that I don't generalise to 'more salt is better for fermentation' which you might think is a cop-out just because the results didn't go the way I predicted, but there is a reason: From some reading I did at the same time as running this experiment, I learnt that whilst salt is generally bad for bacteria (which is why salting is an effective method of preserving food) lacto-bacili are more resistant to salt than most. The reason for adding salt here is to kill off the bacteria that we don't want, leaving no competition for the ones we do want. If we add too much salt we'll kill off our friendly bacteria as well. There is an optimum level of salt and it appears to be closer to three pinches per layer than one pinch per layer of marrow. It's still possible that my samphire and sloes had too much salt, but this experiment didn't really address that question because I didn't include such high levels of salt. You could legitimately say that this is a weakness of my experimental design. * Some people believe that this method gives an inferior result, as what you really want is the progression of microbes that occur naturally, to give the full complexity of flavour, not just the one that comes in at the end and makes the acid. Others say it's hard to tell the difference. I don't think I'm that fussy, at least not at this stage. Every year, I wonder what's wrong with me: Where has my enthusiasm gone? Why do I feel like such a failure? Then sometime around mid October the penny drops: It's autumn! I suffer from SAD - that's why I'm feeling rubbish. You'd think I'd learn, wouldn't you? This year, I noticed something else, though. While my motivation for things that I ought to be doing (fixing the conservatory roof; publicity for Wild West Wales) was rock bottom, I was quite happy foraging and preparing food for storage. These can be quite tedious tasks, but I had no problem motivating myself to wash and dry laver, or to peel and chop a whole carrier bag full of apples that a friend gave me. This made me wonder about the nature of seasonal depression. It's always struck me as evolutionarily implausible that so many people should feel sluggish for quite such a large proportion of the year. I could understand it in the darkest, coldest months, when hibernation looks like a good strategy, but SAD often kicks in with the rapidly shortening days, particularly around the equinox in September. I wonder whether it's not actually a general depression, but a switch in motivation to food gathering and storage, at the expense of everything else. In our modern world, there's not much opportunity to express that single preoccupation, so all we see is the loss of motivation to do anything else. Like much of evolutionary psychology, this has more than a hint of the just-so story about it, but it does make a testable prediction: If I could focus all my energy on food gathering and storage throughout September, October and November, and not worry about doing anything else, then I wouldn't feel depressed. I wonder if it would be possible to arrange my life that way? In amongst the grass, and the same colour and height, was masses of samphire! It was fiddly to pick, especially as it was all too easy to pull the roots out of the soft sand (best to leave them, and give the plant a chance to regrow), but I'd brought a small pair of scissors with me, and the only limits to how much we could collect were our patience and backache. 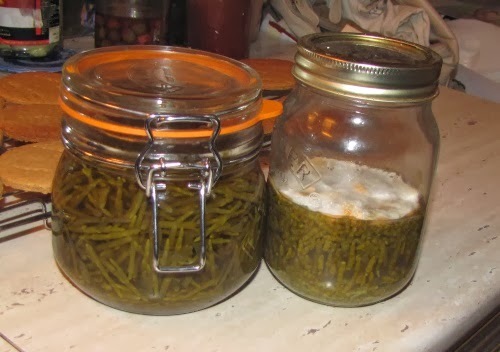 Samphire also makes a most magnificent pickle: fill a jar with it, add peppercorns and grated horseradish; then pour in a boiling mixture of dry cider and vinegar in equal quantities, or else just vinegar. It's as close to a recipe as he ever gets. 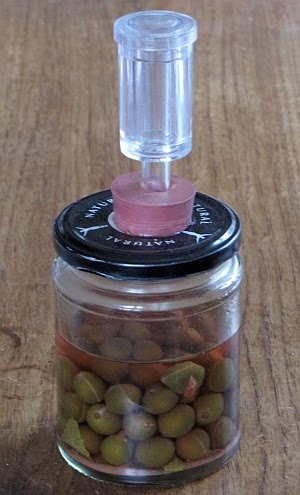 I had some pickling vinegar, but it had previously been used to pickle eggs. Luckily, having been standing for some time, the smell of eggs was greatly reduced. I found various instructions online for removing the smell of eggs, that all involved boiling in vinegar. I boiled it for a while, both to increase its strength and further reduce the smell of eggs. Instead of peppercorns and horseradish I added a few mustard leaves and some garlic mustard seeds. I didn't have any cider, but I had left half a bottle of bay herb ale (I'll tell you about that at some point) in my neighbours' fridge which tasted cider-ish, and after standing for a few weeks was probably quite vinegar-ish, too. I also added a generous splash of cider vinegar. Never mind about the mould, I thought, it's only on the surface - I'll just remove it when I want to eat the samphire. When I opened the jar it smelled terrible but, undeterred, I removed the mould and a thick layer of samphire from the top. Unfortunately the lacto-fermented samphire, whilst otherwise quite nice, was tainted by the mould. It's OK, but not the best. The conventially pickled samphire wasn't that great, either. The vinegar was rather strong - perhaps I reduced it too much - and was that still a hint of egg? Maybe mustard wasn't the right seasoning, either. The samphire had also lost its crispness, which is a large part of the appeal in the first place. On the whole, while fresh samphire is delicious, I found pickled samphire a bit disappointing. I'll probably try lacto-fermentation again, and hope to overcome the mould issues. If I get it right, I think that'll be a really nice pickle. Gutweed (from dried) - I'd forgotten how gritty this batch was. I think the rest may go on the compost heap. As I started out on this new life, a friend expressed concern that I wouldn't find it fulfilling. Over the last year or so, that question has been lurking in the back of my mind. Not just, Is this fulfilling? but, What does that even mean? 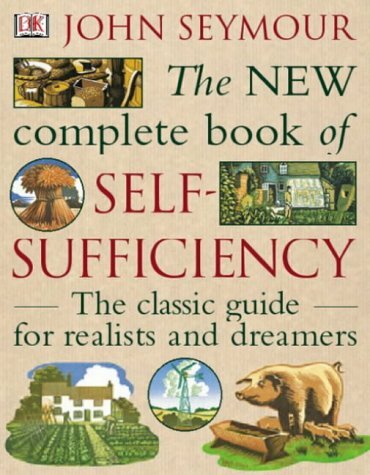 Recently it struck me that Fulfillment is the same thing as Self actualization in Maslow's hierarchy of needs. That might not sound like much of an step forward in explanatory terms, but having spent much of my career in Psychology departments, this sort of thing has seeped into my thinking. The desire to become everything that one is capable of becoming. That made a lot of sense to me. Start by thinking about what one could be; fulfillment is when all those could bes become real. At the same time, it's problematic; to become everything one is capable of becoming. but what I could not be is all of these things. Life is full of choices and, to use a well-worn metaphor, the journey through life involves taking one path and turning away from another, many times over. Sometimes it's possible to go back and try a path that was turned away from the first time round (though it wouldn't be quite the same path on second approach... The metaphor may be breaking down a bit here), but it's not possible to explore all of the paths thoroughly. One life just isn't long enough to do everything. I think the concept of fulfillment is flawed. We can survey a range of possibilities and deceive ourselves that we could have/do/be everything. What the glittering possibilities show us is that we could be anything not everything. So by stopping the intellectual work I was doing before, am I, in any meaningful sense, unfulfilled? The meaning of this negative state is perhaps a little easier to grasp than the corresponding positive, Fulfillment . To feel unfulfilled is to feel that one could be doing more, doing better, doing something more satisfying. This is a dissatisfaction with life that could be entirely valid, and a prompt to try and change things, to fill life with more satisfying activities. The important thing to remember is that one can't do everything. If you choose to do more fulfilling things, you will almost certainly have to stop doing some of the things you do at the moment. There are only so many hours in the day. As for me, I'm very happy with the choice I've made. Today I received a request to review a paper for a scientific journal. I might do it because the editor who asked me is a very nice man, but I have no sense that I'm missing out by not doing this kind of work. We went to visit my sister for a few days earlier this week. She lives in Sussex, right on the border between East and West Sussex, which is an excellent place for foraging. She'd spotted some fruit in a hedgerow and was puzzling over the identity. What do you think, are they sloes or damsons? she asked me. Big sloes, I replied confidently. Then she suggested I taste one... Ah, I see what you mean. They tasted much more like damsons, without the mouth-puckering acidity of sloes. There were also some ordinary-sized sloes growing nearby, so we picked a few for comparison. We picked some of the unknown fruit and headed home to do some research. It turns out that we were far from the first people to ask, "Is this a damson or a sloe?" and the answer is usually, "Probably a bullace." We learnt that there are several closely related species, including plums, damsons, sloes and bullaces, and hybrids are not uncommon. Some say that the bullace is the original native species and all the others are either imports or hybrids, but on the other hand, there seems to be quite a lot of regional variation in what's actually referred to by the name. Whatever the details are, bullace seems to be the best identification for the fruit we'd picked. I'd been hoping to find damsons to make fruit leather but as these taste much the same, they'd do just as well. First I stewed them thoroughly, then pushed through a sieve to separate pulp from skin and stones. The pulp was still quite liquid so I reduced it by boiling until it was a thick paste then added sugar to taste. The final stage was to spread it out on a baking sheet and put it in the oven on a very low heat to dry. There are two approaches to fruit leather; some treat it as a very firm jam and others treat it as dried fruit in sheet form. I'm in the latter camp, which means that I try to evaporate almost all of the water and add only a little sugar. The alternative is to leave more water in, add lots of sugar, and boil to setting point. Most of my bullace leather has been packed away in a tin, but I ate the offcuts with a little mascarpone cheese - divine! A tip: if you wish to serve this to guests, don't prepare it in advance. Moisture migrates from the cheese to the leather and the effect is not good. * Opinion is divided on whether insititia is a species in its own right, or a subspecies of Prunus domesticus, as well as on how many 'i's the word should contain, apparently.